Need2soul return with another instalment in a series of parties celebrating a decade of house music. Since the brand’s conception in 2004, Need2Soul have established itself at the forefront of the house music scene, and gained a solid following of high profile DJs/Producers as well as loyal and dedicated fans of all ages. Need2Soul continue to host some of the best parties in London and Europe with special appearances at the infamous Boiler Rooms with resident stalwart Ron Trent earlier this year…. Proving that they are consistent in delivering an array of talent, sold out events and stella line ups. On Sunday 24th August not one but two of Chicago’s finest jet in for a special bank holiday gathering at Plan B in Brixton. N2S are very proud to announce Glenn Underground as the headliner, founding member of Strictly Jaz Unit. Raised on a diet of disco classics and freeform jazz of 70s Chicago, where house music was born. Taking inspiration from pioneers Larry Heard, Ron Hardy, Lil‘ Louis. Glenn has produced some of the most respected deep house music for Cajual, Prescription Guidance and Peacefrog. He is one of the few Djs who can walk the line between deep jazz, house, disco, soul and funk influenced house classics. The man is an astonishing and inspirational producer and we cannot wait to hear what he has in store for Need2Soul. Step forward, Boo Williams, Chicago house veteran and innovator who will deliver the goods, also known for his quote “House music will never die! Love, peace and hair grease”. He is inspired by Larry Heard, Lil Louis and Marshall Jefferson, had releases with Ovum Recordings, Peacefrog, Rush Hour, Relief, Cajual and collaborated with Green Velvet. Boo has a healthy discography, strong reputation and released a series of albums called “Home Town Chicago”, the first of many reissues on Anotherday Records. Watch out for his great presence, as he will be firing off on all cylinders and will certainly blow your mind. Representing the UK, British singer, songwriter and musician Omar will be performing a live PA, proficient in playing trumpet, piano and percussion. Omar is described as the father of British Neo Soul music, and has since managed to collaborate with Stevie Wonder who unbeknown to him was a fan of Omar, it only took 14 years for them to finally jam together and so their song “feeling You” was born. Omar will be performing ‘Feeling You’ aswell his exciting brand new release on Makin’ Moves Records titled ‘Ding Ding’. Plan B’s basement room will be hosted by Making Moves’ own Matt Langrish-Smith and Jamesey, local superstars in the making. The boys have established their names within the industry by hosting residences here in the UK at The Prince of Wales, Bedroom Bar, The Garage and most recently at Catch in Shoredtich as well as holding down a weekly Saturday night slot on House FM Radio. Need2Soul decided to host their next party at Plan B as it features a huge Funktion One sound system, and its stripped back warehouse-style interior, makes it a perfect contender for this August bank holiday party. Following on from our World Cup Final party at Catch last weekend, we start up our new monthly residency upstairs at Catch in Shoreditch on Friday 25th July. The upstairs resembles a New York style loft with great wooden floor for footwork expression and tip top sound to match! Join Makin’ Moves residents Matt L-S and Jamesey as they embark on a journey of deep and soulful sounds from 9pm -1am every month in their new home! Look out for special guest appearances and PA’s from artists on the label! This event is totally FREE so you’d be a full to miss this! Tiger Wilson is a name that has already been causing quite a stir in the soulful corners of the US House Music scene. Now the New Jersey native is set to bring his brand of smooth vocal House and R&B across the Atlantic, by teaming up with UK label Makin’ Moves, releasing the ‘I Can Love You Betta’ EP. Wilson’s tenure in the music industry, as a producer and songwriter, has already seen him working with artists such as Jaheim, Estelle and Chris Brown. It was, however, realising his dream of working with Timmy Regisford, renowned House producer and A&R legend, that fuelled his progression as a solo artist. Their collaboration lead to the release of New York club favourite’s such as ‘Masterpiece’, ‘In The Club’ and ‘Burning Hot’ and it was whilst in the studio with Regisford that Tiger Wilson revealed his vocal talent’s on the dancefloor smash ‘Sometimes’. By mid-Spring of 2013, Wilson was approached by UK label Makin’ Moves’ owner, Matt Langrish-Smith. The London label boss had been following Tiger’s development as an artist and knew the massive potential in an EP project that would showcase his talents on a grander scale. Tiger then got to doing what he does best, writing new music, and the first single, ‘Anything Is Possible’, was born. The song-driven soulful house track was supported heavily in the NYC scene, including noteable plays from Louie Vega and Kevin Hedge on NYC station WBLS, sending Tiger touring around the states. Wilson is now ready to release the three final tracks of the EP, ‘I Can Love You Betta’, ‘There Is Hope’ and ‘NYC Track’. The EP effortlessly blends his experiences and influences, from Philadelphia and Motown soul, Gospel and R&B, to his recent dance-floor attention. ‘I Can Love You Betta’ is a more than just a collection of great music, it’s a statement of intent to inspire, with the simple message of “live life to the fullest”. ‘Love You Betta’ will be released in September, 2014. DJ Fudge has long been a force in the house music scene since his Trouble Men days on the well-respected Kif Recordings and alongside his good friend Hallex M has carved a notch in the new breed of rare talent over the past years. Both guys had longed to work with UK soul legend Omar Lye-Fook. And late last year their dream came true when Omar visited Hong Kong where Hallex and DJ Fudge both currently reside and there they worked on two tracks which have had people talking about for sometime. The first was ‘Simpatico’ which was released on Osunlade’s Yoruba Imprint earlier this summer and has become an anthem from Ibiza to Croatia . ‘Ding Ding’ the second track we feel is even better, an instant dance floor filler! Omar delivers a stellar performance that has already been getting rave reviews from the few djs that have been playing the promo to in recent months. We’ve enlisted the help of three great remixes on this project and will be releasing this package across two packages. First up on release one you will be able to get the Art of Tones remixes, which are simply stunning. Art of Tones is Ludo Llorca and has been making great waves with his sound for the last summer releasing on other labels such as Local Talk. Package two will feature remixes from Loic L and Chicago’s deep house master Glenn Underground who brings an nostalgic classic garage mix. Congo Music Publishing / Kobalt Music Publishing. Part One package – Original & Art of Tones Remixes available to purchase as an exclusive promo from Tuesday 5th August. All other sites Tuesday 2nd September. Part Two package – Glenn Underground & Loic L available to purchase as an exclusive promo from Tuesday 2nd September. All other sites 30th September. Catch Omar performing a live PA of ‘Ding Ding’ at Need2Soul’s Bank Holiday Weekend party at Plan B in Brixton on Sunday 24th August. MAKIN’ MOVES WORLD CUP FINAL PARTY! We think you’ll all agree that this World Cup has been the best ever in history, ok England were awful but it’s been fantastic from the point of view of the Brazilian people and the event as a festival of colour and people coming together to enjoy football. The venues have been great and we’ve seen the growth of some lesser nations doing so well and willing to attack and play the beautiful game the right way! On Sunday 13th July we come together to celebrate the final game of the tournament at the vibrant setting of the Catch Bar, in the heart of Shoreditch. 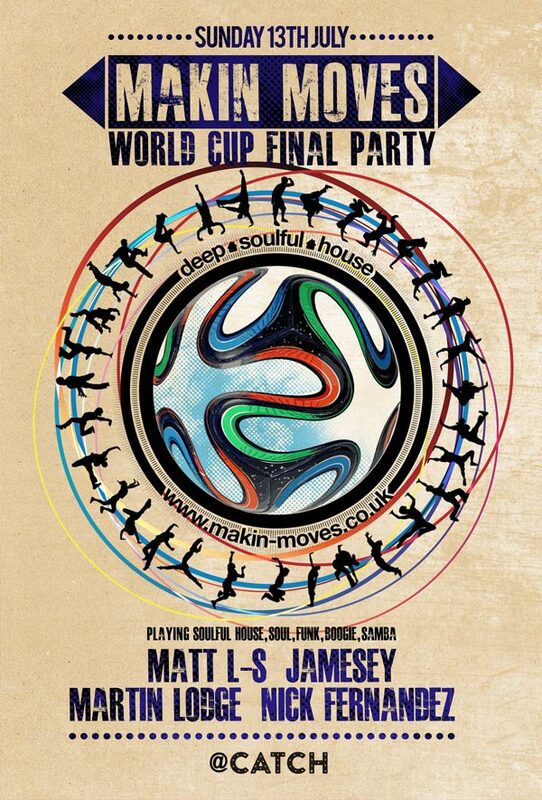 The game kicks off at 9pm, before that Makin’ Moves residents Matt L-S and Jamesey will be dropping their signature soulful and deep house sounds plus some soul, funk and samba sounds from 4pm getting you in the mood for the finale. Also, joining Matt and Jamesey will be Martin Lodge from Suncebeat/Mi Soul radio and Nick Fernandez from M.E.M/House FM bringing their unique vibes to proceeding until midnight. Two years ago in the summer of 2012, we kicked our label off with this great release SMI featuring Shea Soul ‘Just Fine’ with remixes from David Harness and Jihad Muhammad. It was a big favourite with a lot of people and still played a lot today across the world, the release set the tone for what was to come on our label and we’re very proud to have released so much great music up to this point but this is just the beginning! We now present the unreleased Shelter Remixes which havent seen the light of day til now. Many djs have asked us about these remixes in the last year both at our events and on our weekly radio show on www.housefm.net and so we’re proud to finely be able to release them. Timmy Regisford hailing from New York, is a legend in the house music community having remixed the biggest artists in the industry including Stevie Wonder and Chaka Khan. Timmy liked the original track so much he wanted to remix the track and what a great job he’s pulled off. Available to purchase as an exclusive promo from Tuesday 8th July. All other sites 5th August. Produced by SMI for SMI productions. Vocals arranged and recorded by Shea Soul. Licensed courtesy of TwoPointNine Ltd. Tracks 1 & 2 – Remixed by Timmy Regisford @ Shelter Studios, NYC. Mixed by Adam Rios.